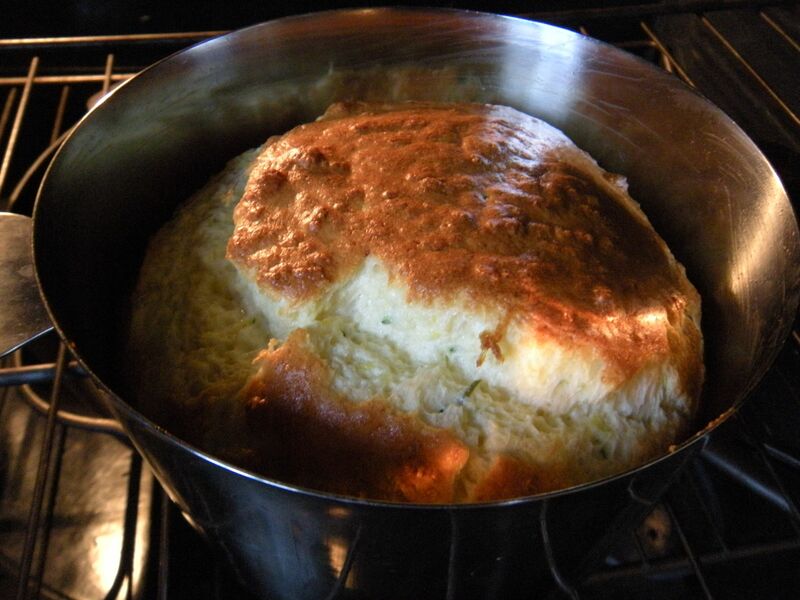 zucchini souffle! . . .
Have you ever made a souffle? It’s one of those things that people sometimes think is so hard to pull off that it ranks right up there with learning how to dance the tango or something, right? Well, anyway, I’ve been experimenting with making zucchini souffles, using a French Charlotte mold with heart-shaped handles. 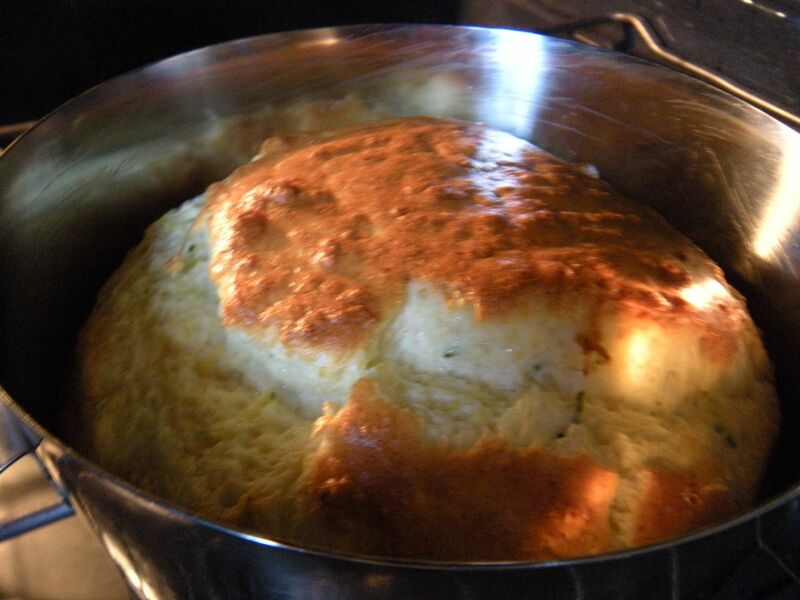 The bottom is slightly smaller than the top, making it easier for the souffle to rise. To make it less daunting, I make the souffle in different steps, spaced a couple of hours apart on a leisurely Sunday afternoon. Each step takes little time and allows for the souffle components to reach the right temperature (tepid) before finally folding in the beaten egg whites right before you’re ready to bake it in the oven. Here are a few easy steps if you’d like to try it yourself for a classic and tasty supper. 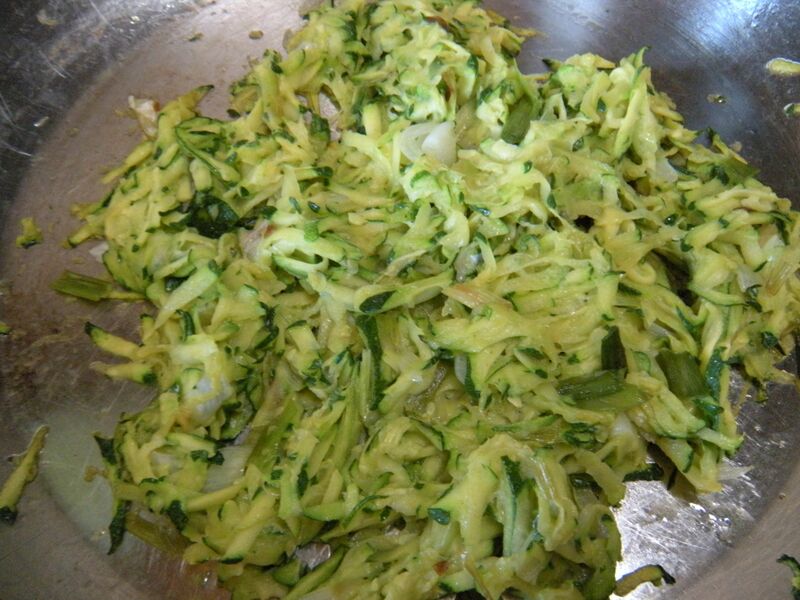 sauteed grated zucchini, scallions. . .
2. In a clean skillet, melt 2 tablespoons unsalted butter, add 2-3 tablespoons of flour and mix in quickly. Stir in a cup of whole milk and whisk together until it starts to thicken. Separate 4-6 eggs depending on size (room temperature) and add one yolk at a time to the bechamel sauce. Add one cup of shredded cheddar or gruyere cheese. Let it melt. 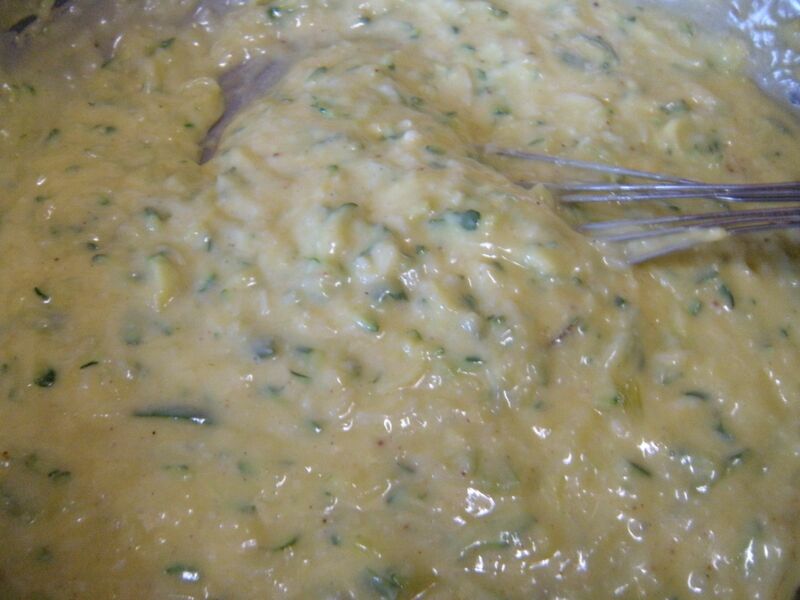 Whisk together and add the zucchini mixture from step one. Season with Maldon sea salt, and a little nutmeg if desired. Let cool. Preheat oven to 400 degrees. bechamel sauce with cheese and zucchini with some nutmeg. . .
3. Using an old-fashioned hand egg beater (I have two) or a hand mixer, beat the egg whites until peaks form. Add about a cup’s worth to the zucchini cheese sauce and fold gently, using a paddle motion (down, up, over and back down into the mixture, folding air in all the while.) When blended, add the rest of the beaten egg whites and do the same thing, being very careful to allow air volume to be folded in along with the egg whites. buttered charlotte mold and egg whites that will be beaten until stiff. . .
inside of the mold with parmesan cheese. 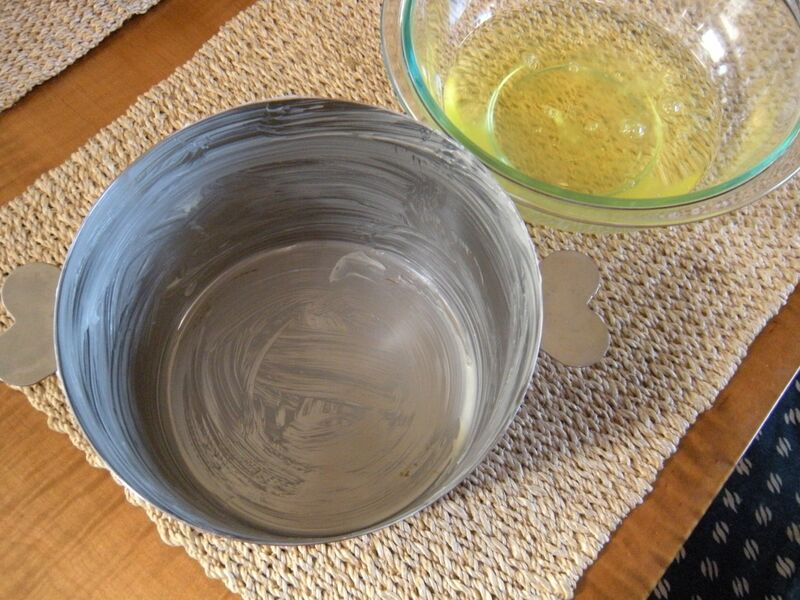 Gently fill the souffle dish with the soft, souffle mixture. Slide into medium rack of the oven and immediately turn down the temperature to 375 degrees. Turn on the oven light if you want to peek at the souffle without opening the oven door. Bake for at least 30 minutes and up to 45 minutes until top is golden brown and the inside is cooked. Don’t despair if at half an hour, it looks like it’s not going to rise. Wait a few more minutes and it will. When done, the souffle will look gorgeously poufed and the center should look as if it’s cooked even if it is slightly jiggly. Turn off the oven, open the door and let the souffle sit on the rack for a few minutes while the oven temperature drops. Dress a fresh cress salad with a simple lemon/Japanese vinaigrette. Seat yourselves at the table and place the souffle in the center of the table. Using an elegant silver serving spoon, serve the souffle, pass the salt, coarse pepper and enjoy! There’s something satisfying about eating a healthful and modestly economical dish for our Sunday night supper. It might take a little practice (the lightness of the sauce matters!~) but the golden appearance and savory taste of this souffle is definitely worth it. Beautiful, and looks and sounds delicious!